For the windows in the front doors. For the windows in the rear doors. Stopping the one-touch function Press or pull the button for the appropriate window again. 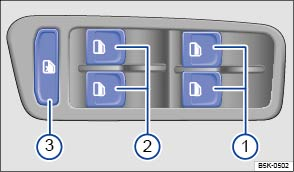 The safety switch disables the electric window buttons in the rear doors. The yellow indicator lamp in the button will light up. The electric windows will only function when the ignition is switched on. The windows can still be operated using the buttons several minutes after the ignition has been switched off, provided that the driver door and front passenger door are not opened. If the vehicle key is removed from the ignition lock and the driver door is opened, all electric windows can be opened or closed by operating and holding the window button in the driver door. After a few seconds, convenience opening/closing is started .